Do we all know how to lighten-and-healthen a recipe, or adapt it to the ingredients we have on hand? Yes, I know “healthen” isn’t a word. You knew what I meant, right? I was looking for something to do with a brown banana, a bunch of slightly stale but otherwise fine granola, and various other miscellaneous Things In My Pantry. So I got on the internet and did a search for “banana granola bread.” Lots of potential recipes came up—including this lovely one from the Barefoot Contessa on the Food Network. Now, I love Ina Garten. She’s a little lower key than Paula Deen, whom I find exhausting, and she just seems lovely and classy. But her recipes! I see the quantities of butter and sugar in things like this simple muffin recipe and I just go, “Nope. Not a chance. We’re not eating that.” These, to me, are rare special occasion treats, not things I’d happily plop into a lunch bag for my kids several days running. That’s two sticks of butter. And two cups of sugar. Right there is where my problems kick in. I also can’t sell my kids on walnuts, but that’s not a health issue—they are actually very good for you. But…I don’t want them here. So: first step is that I only have one banana. Which means I have two choices: I can halve the recipe, or I can use applesauce in place of one of the mashed bananas. (Trick one. Pureed or mashed fruits are pretty interchangeable in recipes like this.) Since I’ve never made this before, and since it’s muffins instead of the cake or loaf I prefer, I’m going to halve it. Here’s where the fudging happened some more: I only had the one banana, so I couldn’t do the medium dice thing. I think this is where the cake’s moistness lost some of its punch, or maybe it was using yogurt instead of fruit. This, or a chopped up apple or something, would have been good to include. I mentioned there is no walnut love in my house, so I just doubled the amount of granola. Most of the time, when added chunky ingredients go into a recipe, you can just do one-for-one substitution, although you need to be a little careful of moisture content. (Trick five.) And why would I add sweetened shredded coconut when I have perfectly good unsweetened? In it went. =18-24 muffins depending on size @30-40 minutes also depending on size. So here also I needed to watch carefully; the muffin recipe says 30-35 minutes, so I started checking this one at about 25 minutes. It took 35. I didn’t do any sprinkling of stuff on the top, though in hindsight that would have been a nice touch. It’s a really nice little cake/bread/whateverthingy. Plenty sweet enough, though not decadent; the butter I did use helped give it a nice little crunch to the outside and it has a nice simple flavor with the granola, banana, and coconut all working together but nothing overwhelming everything else. It would have been helped along by keeping a few elements I needlessly dropped: the moisture of the added diced banana and the moisture of the sweetened coconut (the unsweetened is very dry) would have made a pretty big difference, I suspect, so attentiveness to that aspect of the substitution would have been a good thing. Ina would probably shake her head and gently but emphatically stamp her bare foot upon the recipe (if not the cake itself), and just to be clear, hers is probably way more amazing—butter has a way of doing that in a recipe, as do some of the other little touches—but this gets the job done and I feel comfortable passing it out for breakfast or lunch. Anyone have any other recipe-modification tricks you like to use? My cousin's son is a teenager, but he still remembers the day he was 3, visiting our house, when we made peanut-butter popcorn. He stood on his tippy-toes to help me turn the popcorn popper, and watched as I melted the peanut butter for the topping. After all these years, he still vividly remembers that cool Kansas afternoon. For our last Homemade Snacks installment, I'm sharing the simplest of recipes for one of the most desired treats by my children: Peanut Butter Popcorn. My mother used to make this as a treat for us as kids, and the peanut buttery, almost caramely, coating was to die for. There are no measurements to this recipe; just eyeball it and enjoy! Add in brown sugar to desired sweetness. Unfortunately (for my carbon footprint) I need to travel a lot for my job. Thankfully I have an extremely fuel efficient car and no children (yet!). One travel necessity that I hadn't worked out until this most recent trip: my soap bar. A few years ago my husband and I made the switch to only using bar soap, which resulted in kicking my body wash addiction. We found a fabulous solution to make our soap bars last an extremely long time in the shower (mason jars and rocks!) but I still hadn't figured out a good way to transport my soap when I travel. I don't want to buy a plastic carrier (ugh more plastic, and buying something just for travelling seems wasteful). Hotels create a truly phenomenal amount of waste. Just those bars of soap you open up to wash your hands have to be thrown out between guests (according to Grist more than 2.5 million bars of soap a day get thrown out in the USA- although that post is also cool as Hilton is recycling their soap!). If I decide not to use their body wash packaged in plastic, it will reduce the amount that needs to be thrown out. (Honestly, who uses hotel stuff anymore? They should keep it at the front desk so if people need it they can ask...). A weird candy tin that my friend had gifted me. It was the perfect soap size, except washing out that cheap metal tin afterwards was awkward (and it has never recovered). An old Lush soap bag. Although it worked very well for about one night, the paper started to shred before I even got it home. Paper Towel (we got from my parents cottage as we don't have any in our house) or toilet paper. This was a sad moment in my soap carrying- why did I even think it could work? The paper stuck to the soap for days. This week I tried a cloth bag. I had to stay at two different hotels this week (and my parents house) so it was really put to the test. I was gifted some soap nuts (that I've never used) and they came in this pretty cloth bag that is the perfect size. Surprisingly, although the cloth gets a little damp, it dries out wonderfully in my suitcase and the soap easily comes out for the next use! It isn't bulky, doesn't weigh a lot and will be extremely easy to wash.
We hope you have been enjoying the posts about homemade snacks this month. 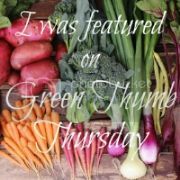 Here are some posts about snacks and snacking from the archives of the Green Phone Booth. I was super inspired by Green Bean's post about a homemade snack swap. Don't miss Green Bean's recipes for fish crackers and bagels too. During a month without processed foods, the Conscious Shopper uses her bread recipe to make pretzals, English muffins, bagels, and cinnamon twists. SustainaMom wants to keep it super simple by growing snacks that can be eaten straight out of the garden. 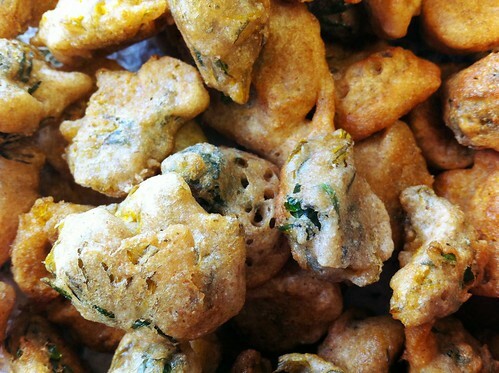 EnviRambo shares her recipe for rosemary garlic crackers. Emerald Apron lists her easy, unprocessed homemade snacks and asks for additional ideas from readers. Green Bean discusses trying to keep up with the snacking needs of growing children. Check the comments for easy ideas from our readers. Now it's your turn! 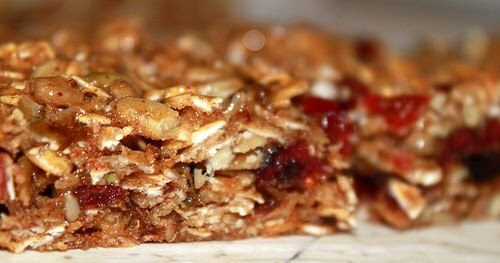 Please add your favorite ideas and recipes for homemade snacks. Link up your post below or leave a comment. For my husband's birthday this year, I bought him a dehydrator and a set of beef jerky spices. The set even came with a tool, not unlike a caulk gun, to make the beef jerky into strips or tubes. My husband was way more excited over this gift than I had anticipated. To be honest, I thought that he would open it, try it once or twice and then forget about it. So when I ordered our his dehydrator, I also purchased the fruit roll up trays... it's true. I bought him a gift and have every single intention of using it myself. I have plans for that dehydrator, once my husband stops making jerky every weekend. I had not realized the full impact of his enthusiasm and the power that dried meat has over men. I also had not ever actually tasted beef jerky. Or turkey jerky. Or deer jerky. Don't tell anyone, but the last batch of jerky he made dwindled quicker than he thought it would largely due to me sneaking pieces to snack on with apples and cheese in the afternoon. Shhhh! But without further ado, here are my top 5 plans for dehydrated snacks! Right now, in my fridge sits a quart of strawberries waiting to make these. I'm very excited. Who doesn't love fruit roll-ups?! Who needs to pay 6 dollars a pound for banana chips? I can't wait to do pears and apples too. Kale Chips. I love kale in a salad, but am terrified to try making chips in the oven. I need to do some actual hunting for tips on this, but I think I'd like to try drying my own herbs this year in the dehydrator. Specifically chives and parsley. Dog Treats!!! They are our best friends, right? Do you have a dehydrator? What do you use it for? I was having a conversation with a friend on Facebook about junk mail and she didn't know there were websites to help you reduce how much you get. I have gotten ours down to almost nothing so I thought I would share some of the sites I have used. Catalog Choice- This site is the one I use the most. You can enter any of the catalogs you get and they help you remove yourself from the mailing list. DMAchoice- This is another site that helps you get off of mailing lists. PaperKarma- And of course there is an app for that. I haven't tried this one yet but it says it helps you get rid of your junk mail and all you have to do is take a picture of it. You can also reduce your mail by asking businesses if they have paperless options. Many banks, utilities, health insurance, etc... have moved to paperless. This helps not only reduce the amount of paper you have to recycle but also prevents lost bills! 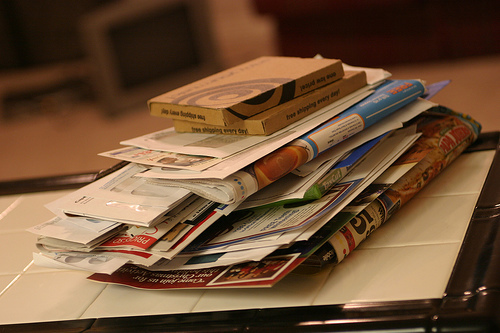 So what steps have you taken to reducing the amount of junk (and other) mail you receive? I would love more ideas because you can never have two little junk mail! Having really resonated with Emerald Apron's post about lead in lipstick, my attention was immediately caught when I got a link to this article from Humana, my current health insurance provider. Have a seat, clear a spot on your desk on which to bang your head about a dozen times (you can even pad the spot with a pillow or something if that’s how you roll), and click over there. Then come back. Okay, did you read it? Bang your head a few times? 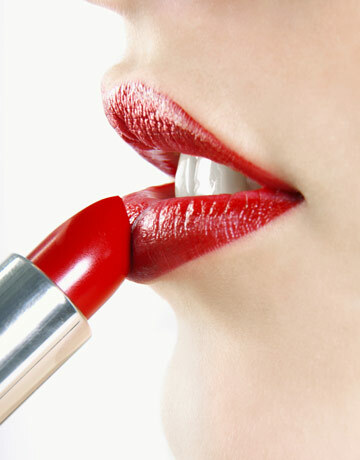 Fortunately, the article tells us, “So while there are very small amounts of lead in the dyes that are used to color lipstick, the amounts are within the limits allowed by the FDA.” Which is great, because the FDA is so conservative in making sure nothing’s approved unless there’s pretty good evidence it really is safe. Like BPA. And GMO’s. And rbGH. So I’m sure that previous bit about lead building up in the body over time has been taken into account when considering how much lead a person might ingest in, say 20 years of putting on lipstick every day…added to other sources of lead and/or other heavy metals that build up in the body…and other sources of contamination in our environment and food pretty much all the time. It’s surely safe, right? The FDA says so. So, to sum up: my health insurance company has just sent me a note to reassure me that even though yes lead is poisonous, the fact that it’s in my cosmetics (or would be, if I used them) isn’t something I have any reason to worry about, because it's a very small and safe amount of the poison. The children are watching. And they take notice. At the end of the day, it's not whether you're writing letters to congressmen that your sons and daughters see; it's the small steps you take in life that they resound to. Maybe it's the cry over polar ice caps or global warming spurred on by your one-time use of hairspray. Or worrying about how best to preserve (and oddly, reuse) your dying horse. The kids have taken on your values. And that might be your greatest legacy of all. Kenna Lee's enjoyable new book, A Million Tiny Thins: One mother's desperate search for hope in a changing climate, she balances her dream of creating a better world for the next generation and fears of what her children might inherit with the realities of juggling career, relationships, parenting, time and money. It's a delicate balance, one that may tip to one side or another at times, but truly a juggling act. Her story resonates clear with many parents trying to do the "right thing," but I'll admit by mid-book, I was hoping she'd have that aha moment, that moment of clarity where it all comes clear. But the reality is, while you can create your own sense of what works, circumstances in our lives - those we can control and those we can't - continue to evolve. What Lee ultimately realizes is that you don't have to create a great movement to make change; in fact it's the million tiny things we do in our life that truly tell the story of who you are and what you stand for. Kenna's book comes out for Mother's Day, but I'm giving away my copy of the book to a GPB reader to enjoy! To enter, leave your favorite "little" tip for being green. I'll announce a winner next Saturday. My mother called in the morning. She said she'd just talked to my brother; she'd needed a kind ear to bend on a situation that was bugging her. Maybe she needed to unpack the problem further with me? Or, maybe she wanted to commiserate about the bad congestion I heard in her voice? "No, I'm calling for another reason... How are the bees?" The bees! Yes, they have been consuming nearly all of my attention this month. No joke: I think about them as I am falling asleep at night, and they are the first thing on my mind when I wake back up in the morning. TruffulaBoy #1 and I took our local beekeepers' association short course this winter. For six weeks, we learned about the finer points of bee anatomy, setting up a hive, bee illnesses, bee-friendly plants, honey harvesting, and more. We listened with rapt attention, took notes for our friends who missed sessions, and yes, luxuriated in the honey samples which were passed around. The next thing was to determine whether we'd try our hand at keeping our own bees. I was so overwhelmed by the amount of information to process that I was unable to make any decisions. This was not good, as the clock was ticking, and I was already behind. Way behind. The deadline for ordering bees approached rapidly, and then... passed. The time pressure only froze my brain further. And, that's where this project took on a fascinating twist: a community of support emerged. A work colleague offered to help me build a hive. A fellow morning bus passenger also volunteered himself for carpentry support. A bee club member, and fellow homeschooling mama, gave me tips for sewing bee veils. A food club friend and bee classmate opted against bees for this year, but pledged to help us in anyway she could. In addition, the ladies in my work group inquire daily about progress, as does my commuting buddy. My parents are fascinated by the coming of our new family members. On the shoulders of these people and their enthusiasm, I placed a bee order. Our deck, and then our living room was transformed into a woodworking shop as we raced to finish a hive in time for the estimated bee delivery date. A snag emerged when the delivery date came and went without that magic phone call to please come immediately for pickup. Somehow, my order was overlooked. I could hardly quell my frustration. This week has been a good exercise in patience, and in the faith that a good solution will emerge. That support community is rallying around us. In the meanwhile, I'm continuing to read and learn at a furious pace. The pained decision process over, I'm peaceful about having made my go/no-go choice in favor of the bees. Already, the anticipation of their coming has blessed us with the kindness of our family, friends, and complete strangers. I look forward to discovering what other secrets these special creatures will unfold for us, in addition to sharing in the gifts of their honey and wax. The Climate Crusader forages for snacks this week. It's dandelion season where I live. Almost everywhere you look, the golden yellow flowers are showing their smiling faces. While I've spent my fair share of time battling these weeds in my garden, I can't help but enjoy the sight of them. They make me think of spring and sunshine and new growth. While dandelions have an unfortunate habit of taking root where they're least wanted, they actually have a lot going for them. They're resilient plants, remaining green long after their less-hardy cousins have wilted. Plus, they're edible, and highly nutritious. They're even reported to have medicinal properties. Dandelions reportedly treat conditions including anemia, kidney disease, jaundice, arthritis and respiratory infections, and studies have shown they can reduce obesity. Apparently the milky white juices can even repel mosquitos. Dandelion greens - on their own or in a salad - are a great way to use a plant that you can easily find in abundance most anywhere you look. Why not just accept them and make them part of your diet? While I see the wisdom in that, when it comes to eating dandelions I prefer the blossoms. But first, I cover them in dough and fry them into dandelion blossom fritters. Then I drizzle them with maple syrup and eat them like they're candy. Dandelion blossom fritters are really easy to make. Start by picking a few dozen dandelion blossoms. You may want to choose flowers that grew in an area where there are fewer dogs, just to err on the side of caution. Wash and dry them - I use my salad spinner for this - and pick off the tiny little leaves at the base of the flower, and any remnants of stem. Then batter them, fry them for a few minutes until they're golden brown, and cover them in icing sugar, honey or maple syrup. Eat them while they're still warm. If you're feeling generous, share them with your children. If you're into local eating, you really can't do any better than foraging for food that grows wild in your own back yard. The fact that this afternoon snack tastes something like doughnuts is really just a bonus. 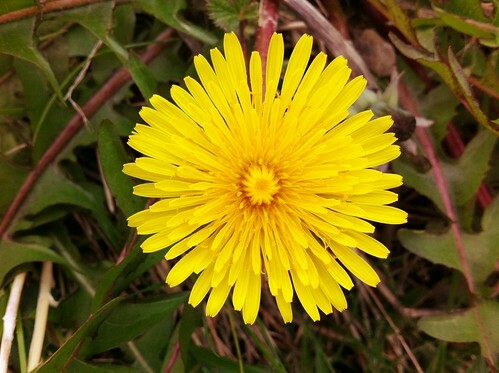 Have you ever eaten dandelions? Or do you forage for other food? I'd love to hear all about it. Frozen grapes are one of my favorite snacks on hot summer days, and it has felt like summer this week here in Connecticut! After spending time at the beach, it was great to come home and snack on these icy treats. All you need are a bunch of grapes and some wooden skewers, carefully place the grapes onto the skewers and pop them in the freezer for a few hours. Enjoy them like popsicles, and store any leftovers in an airtight container or freezer bag in the freezer. If you want to take the lazy route, and I often do, you can put a whole bunch of grapes directly into the freezer, too! It's a great way to store grapes if you buy a lot of them when they go on sale, so stock up. I personally like green frozen grapes, and seedless ones work best. What's your favorite easy snack when the temps are high? It's starting to get warm around here which means it's a good time for a cold treat. 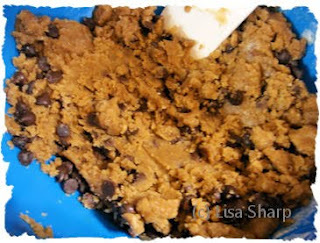 A favorite around here is frozen cookie dough and the recipe I use is egg-free so no safety issues. It's also great for putting in some homemade vanilla ice cream! Roll in balls (small balls if using for ice cream) and flash freeze* until firm, about 20 minutes. *To flash freeze cover a cookie sheet with natural wax paper and make sure none of the items touch. Don't forget to check back often for more snack recipes all month long! My new favorite blog...meet Chocolate Covered Katie! So today, I’ll follow our monthly “healthy snacks” theme by sending you over to my new favorite blog, Chocolate Covered Katie. I discovered her when I was looking for new oatmeal recipes, and she’s got a whole bunch of them. And then I kept looking… and looking…and looking. I don’t think I’ve ever seen such an assortment of amazingly decadent-looking and sounding recipes made with mostly natural whole foods and the kind of calories that are full of good stuff. I mean, just look at this list! So my apologies…but I’m just going to send you over there today! Enjoy! This isn't a blog post about veganism or vegetarianism, but about what my food ISN'T worth. My food has never been worth slave labour. Often products such as coffee, sugar and chocolate are named when discussing human right violations, terrible working conditions, slave and child labour and polluting cultivation practices. Similar discussions surround farming, with purchasing directly from your farmer assuring that your food has been purchased for a fair price. This isn't news to most here in Nova Scotia. Despite this province's tendency towards traditionalism and conservative views, the slow food and local movement is making some pretty significant headway. The farmer's markets are booming and 'Buy Local' movements are getting a lot of press, it's great. 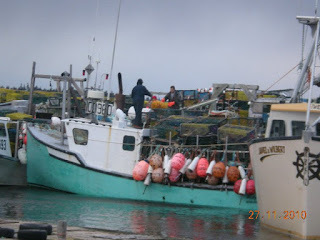 Interestingly enough, with the start of District 34's lobstering season (end of November to end of May), which provides 60% of the global lobster industry, the 'fair price' logic hasn't connected. As a fisherman's daughter, I grew up eating lobster. Yes, I know I was lucky, but let me tell you, we were never rich. 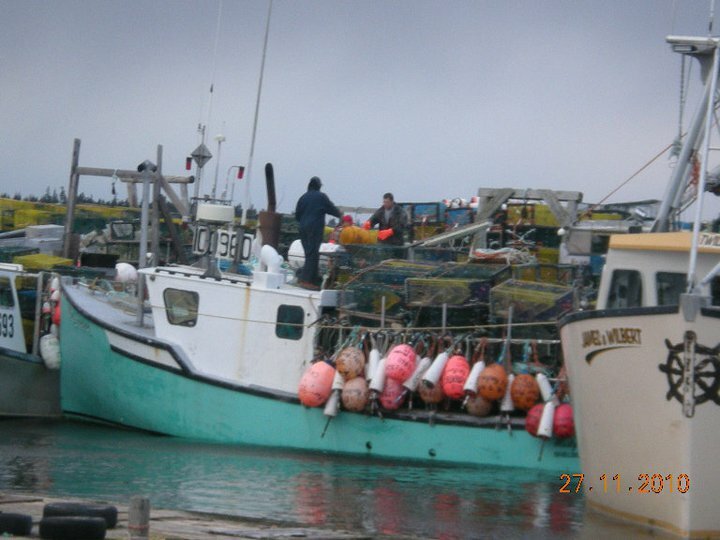 There is this strange misconception in the Atlantic provinces that lobster fishermen from District 34 are well-off. Perhaps there are a few, but they are far between and definitely not the norm. 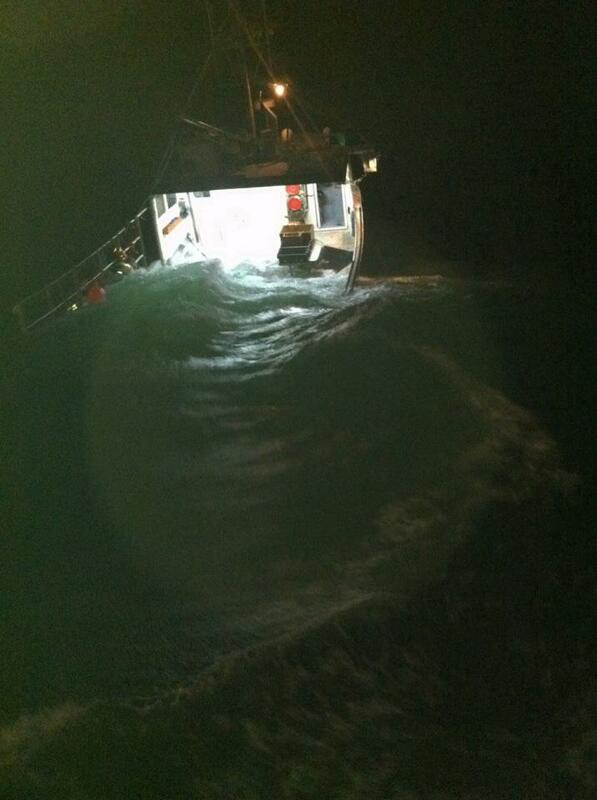 Due to the proliferation of lobsters in this area of ocean, it is not easy nor cheap to become a fisherman. Firstly, there's purchasing a boat. Ranging anywhere from 200-500,000$ depending on where you'd like to fish (inside or steaming far outside). Then there's the license, which also costs another couple hundred thousand. You need to hire at least one other person (if not more) to help, minimum 100$ a day. Fuel costs a fortune and don't forget the traps (or 'pots' as their called home). Over 100$ each, with about 400 per boat, often they need replacing during the year. Beyond this, these fisher-people fish during the harshest season of the year- winter. With winds, snow and sleet, leaving the warf at 3 or 4am to work all day and return after supper, (or stay out for days at a time), it isn't an easy life. Too many have lost their lives in that ocean, with riptides and currents assuring that bodies are never found. Unlike other districts, winter waters mean hypothermia in minutes followed by death. Families and communities never forget this risk. This year the season started with a price of 3$ or less a pound. In District 34, most fishermen belong to a co-op at their warf to whom they sell their lobsters. 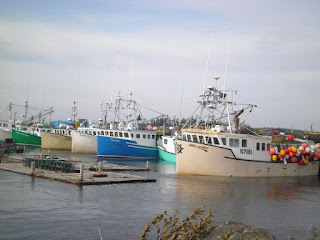 The co-op then sells to buyers, who sell to businesses and ship around the world (including the States, a few years back there was some tension from Maine buyers purchasing Nova Scotia lobsters and labelling them "Maine lobsters"). For most fishermen, there aren't enough lobsters to justify a price of 3$/lb; it costs more to catch the lobsters than they're worth. Unfortunately, most fishermen are too indebted to change careers. With a boat, license, mortgage and house loans their only option is to keep fishing. I don't know about you, but any lobster I eat, special occasion or no, restaurant or no, will never be worth unfair wages paid to fishermen who risk their lives every day to provide us with a delicious delicacy. Whenever possible, buy directly from the fisherman and pay a decent price (at least 5$ if not more). If that's not an option, but you live in Halifax, Pete's Frootique purchases their lobsters for a fair price directly from a fishermen in Cape Sable Island. Not in Halifax? Before purchasing ask where the lobsters come from. Voice your concern with regards to the pricing and purchasing practices of buyers. Ask to know what price the original buyer (not the grocery store) paid the fishermen for the lobsters. Group together with friends who also want lobsters and contact fishermen or co-ops in Nova Scotia to see whether a larger order could justify a trip to the city. People often know people coming up to the city this time of year. If you can afford it, be willing to pay a bit more for fairly priced lobsters. They're a luxury item and as a result worth a few extra dollars to assure you're not contributing to the destruction of an entire community of fishermen and their families. If you are eating lobster- check out some tips on shelling and cooking with my favourite lobster chowder recipe! Living mindfully is so much more than just the obvious. This year my lobster will be fairly priced and worth every penny. My baby girl turns 1 on Sunday. I take the first birthday cake very seriously. I've tested several recipes and settled on a Green tea cupcake with cream cheese icing. I want yellow icing, but I don't yellow #5. I also didn't want to pay 34 dollars for a teeny little bottle of organic, all natural food coloring. I'm here to tell you that in case you didn't already know, turmeric is an excellent food colorant. In the test batch of icing, I used a lot of the spice and couldn't taste it at all... and I knew it was there. I lined up 3 families to test the cupcakes and again, no comments on taste alterations. And there you have it. No chemicals, no cheap, synthetic colors, no hyperactivity. Turmeric. It's not just for pickles and curry. Summer vacation time is fast approaching and you are likely planning what your vacation will be. There is one part of planning you may not have thought about and that is recycling. You likely have a recycling system at home but what do you do when you are away from home? Take the recycling back home with you. This option can be hard if you have very much and near impossible if you are flying but if it's a short car trip it may be doable. Ask the hotel if they offer recycling. Many hotels now recycle and either have bins in the room or if you call down they can tell you where a bin is. Some also will tell you just to leave it on the counter with a note for housekeeping and they will take care of you. You can find a local drop-off. Many cities have drop-offs for recycling. You can find out where one is with Earth911.com. You can use the website or their app iRecycle to find where you can recycle items. Recycle at Target. Target now offers some recycling so that can be an option while you are away. 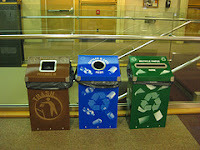 They offer recycling for cans, glass plastic bottles, plastic bags, MP3 players, ink cartridges and cell phones. Recycle #5 plastic at Whole Foods. Whole Foods has recycling for #5 plastic if you end up with any on your trip or have some at home to bring with you. Between all of these options you can likely recycle at least some of your waste while you are away from home. And don't forget to bring reusable water bottles and bags so you have less to recycle in the first place. Do you recycle when on vacation? If so what have you found to be the easiest way to do so? These are the cakes I can make out of whatever fruits, flours, and/or sweeteners I have in the house at any given moment. I make these once every week or two, and it’s easy enough to vary the contents that I can keep doing it without making anyone bored. These are the cakes I cut into squares and send to school for my kids’ lunches, the ones I take in to school on days I want to ingratiate myself with the prof and my fellow students, the ones I take to the nice neighbor who watched my kids for a couple of hours. I’ve been known to eat a few pieces myself, too. I was just discovering what a ridiculous number of these recipes I have over on my blog, and I’m sure I won’t even cover them all here, but I’d like to just toss out an assortment, and you can click over to whatever might sound interesting. My hope here is not so much that you will use the specific recipes (although, feel free, of course!) but that you might see how they are really all variations on each other, and how easy it is to perform that little alchemy that turns a bunch of random stuff into a really yummy cake. Random Fruity Cakes, based on my standby favorite “bundt cake of endless autumnal substitution”. These work with applesauce or apple butter, bananas, and/or pureed pumpkin or sweet potatoes. Or some mixture of the above. Or maybe some other stuff would work too. This is my go-to recipe pretty much whenever I want to make one of these cakes. Honey Apple Butter cake and Pumpkin Butter with Zucchini cake are in here too. Other fruity cakes includes my use-up-lots-of-the-green-bludgers Zucchini Bread recipe. And the Applesauce Cake I made to give our neighbors a little thank you for letting us forage on their very plentiful apple tree to make a few quarts of sauce. Banana Orange snack cake is another I made a long time ago and really need to revisit…these, obviously, are my major go-to recipes. Cakes based on homemade pancake mix, that are based on, well, my homemade pancake mix. I think once I didn’t have enough baking powder for something but had some baking mix, so I worked something out that way. Quite honestly, I don’t think these are as good as the first category cakes, but they are still pretty yummy. I have a simple berry muffin recipe here and a really delicious variation that’s a Honey Berry snack cake—one of those happy experiments gone right. And Blackberry tea cake, another really nice and flexible recipe using frozen berries. Cakes involving chocolate. Not much else needs be said, right? Crockpot chocolate banana pudding isn’t exactly a cake, but it acts a lot like one. And 5 minute microwave chocolate cake in a mug isn’t the kind of snack we’re really talking about, either. On the slightly less decadent front is chocolate banana cake, which is also based a lot on the “endless substitution” model but subs in some cocoa powder for the flour. And throws in some chocolate chips. I’m no saint. Gingerbreads. These include a Pumpkin Gingerbread recipe, and another for “White Gingerbread”—a New England dessert that pretty much lacks ginger at all. Nutmeg is used instead. It’s actually really delicious, but has a lot of sugar in it. In honor of March's Spring Cleaning theme, here are some blasts from the past about cleaning. What cleaning topics would you like to see discussed on Green Phone Booth? Going Green Mama wishes you a Happy Easter! The countdown until Easter has been daily noted by my first-grader. Talks of the reality of the Easter Bunny have been rampant. (I suspect this is her testing me to see if I believe it's "real.") And the excitement of egg hunts at day care have carried the kids through the week. But at home, we've really worked to simplify our Easter celebration. It's not a condemnation of the secularization of the holiday or of the bright pink Peeps, as much as we're keeping our celebrations scaled to size. Novel idea, I know. But rather than torture ourselves with bags of chocolates that will only result with tummy troubles and overly hyper children, we've downsized our Easter giving in recent years. Yes, we do plastic eggs, but they were mostly bought second-hand, and they are stored year to year. I balance that with the fact we don't dye hard-boiled eggs that no one will eat. Rather than scores of candy, we slip inside Annie's bunny-shaped crackers and jelly beans. Sure, we still enjoy treats. They'll get a scaled-down chocolate bunny (they do sell those! ), jelly beans and a few small chocolates. And it will be packaged with "character" toothpaste - for them, a treat. At the end of the day, the kids won't remember how much candy or treats they did or didn't get; they'll just remember their excitement of Easter morning and a day with mom and dad. How do you mark your Easter celebrations? Have you simplified them in recent years? 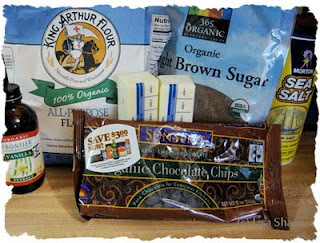 The Climate Crusader shares her gluten-free snacking tips in her inaugural post. A little over six months ago my husband and I went gluten-free. He did it because he's always struggled with digestive issues, and giving up wheat, barley and spelt helped. At first I did it in solidarity with him, but I continued when I discovered that I feel much better when I don't eat gluten. One of the first dilemmas that I encountered as a newly gluten-free person was snacking. Sometimes you want to plan an elaborate meal with freshly-picked local organic greens, and sometimes you just want something quick to see you through the mid-afternoon hangries. When I changed my eating habits, it was suddenly that much harder to grab something quick. Luckily, though, after half a year without wheat I've come up with a number of easy, healthy, homemade snack options. The best part is that these are yummy for everyone, no matter what you eat. Granola -Homemade granola is actually quite easy to make, and it packs a lot of punch. Use gluten-free rolled oats, nuts, seeds and dried fruit, and then eat it by the handful or sprinkled on yogurt for a quick pick-me-up. Rice cakes and peanut butter - I think that rice cakes get a bad rap. I actually really enjoy them ... once they're slathered with fat. I like mine with butter and peanut butter. Quick, easy, gluten-free, and surprisingly tasty. Hummus - Homemade hummus is gluten-free, dairy-free and vegan. Plus, it's delicious and versatile. I eat mine with tortilla chips or rice crackers, or use it as a dip with fresh, raw veggies. Chocolate coconut snack balls - I based my snack ball recipe on Power Bites, which I got from Micaela Preston's book Practically Green. Once again they're gluten-free, dairy-free and vegan, and totally yummy. My kids can't get enough of these. Fruit and veggies - Sometimes it's best to just go back to basics. We could all use more fruit and vegetables in our diet. They're good for us, they're packed full of vitamins, and they're delicious. They're also some of the easiest foods to source locally. I freeze organic local blueberries in the summer and snack on them all year round - so good! Are you - or is someone in your family - gluten-free? 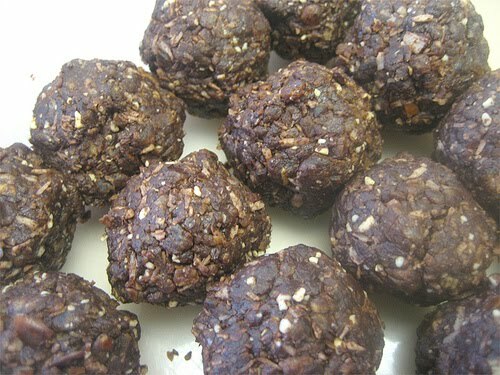 What are your favourite wheat-free homemade snacks? I'd love to hear your tips! Homemade Snacks - Wordless Wednesday with Linky! Our theme here at the Green Phone Booth for the month of April is Homemade Snacks. These are some of our superheroes' favorites! 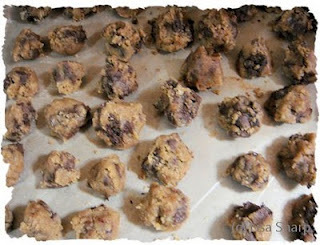 Please link up your Wordless Wednesday post with the Linky, and share your favorite homemade snack in the comments! A lot of people seem to think making popcorn on the stove is hard. I have noticed a lot of pins on Pinterest for how to make homemade microwavable popcorn in a paper bag. However, it's just as easy to make it on the stove and there is less waste, and IMO it's better. This is one of the more simple snacks you can make for your families! And with doing it on the stove it's healthier and you can control how much salt and butter you use. It's also cheap, even the organic popcorn. 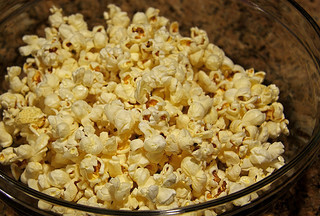 All you need is some popcorn (organic is best), oil, salt and a heavy pan (no teflon pan!). Simply put 3 tablespoons of oil in the pan on medium high heat. I recommend organic coconut oil for the oil, I have also used leftover bacon fat which is pretty darn good. To know when the oil is ready put three popcorn kernels in the pan (with the lid on! ), when all three have popped the oil is ready. 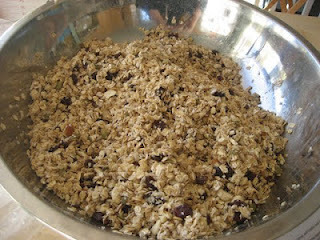 Add 1/3 cup of kernels to the pan, cover and gently shake the pan very often. Also crack the lid open a bit every once in awhile to let the steam get out of the pan. Once the kernels stop popping remove the pan from the heat. Put the popcorn in a bowl and use the same pan to melt some butter, do this to taste. Then simply salt the popcorn to taste and pour the butter over and mix it. It's fun to try different seasonings on the popcorn, I like a little garlic on mine sometimes. A little sugar sprinkled on top is fun sometimes as well. Have a homemade snack you want to share? At the end of the month we will have a linky you can use to share your own post so get it ready. Wait, did someone say homemade snacks? I’m not sure really what to call it–it’s not a quick bread, it’s not a cookie, it’s not a muffin–there’s no flour, so its consistency is really just that of, well, oatmeal. Except cool and in bar or muffin form. Bake at 375 for 30-35 minutes in a baking pan or 20 minutes in muffin tins. Let cool. Cut into squares, or remove from muffin tins. Store in fridge if it’s not going to be gone within a day or two.